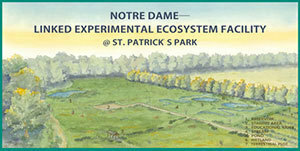 Science Sunday includes tours of the facility, descriptions of research by a dozen scientists from the Colleges of Science and Engineering at Notre Dame, plus hands-on activities designed especially for children. The event will be held at ND-LEEF’s new Morrison Family Pavilion for education and outreach that is designed to enhance year-round community engagement at ND-LEEF. Pavilion designer Aimee Buccellato, a professor in the School of Architecture at Notre Dame who will receive a Citation Award from the American Institute of Architects Indiana at the AIA’s regional conference in October, will be at the event Sunday to discuss the new structure with visitors. In honor of the City of South Bend’s 150th anniversary celebration, this year’s Science Sunday is an official SB150 affiliated event, and researchers will have on hand copies from some of the original forest tree surveys made in the South Bend area in 1829. ND-LEEF includes two state-of-the-art experimental watersheds designed to bridge the controlled environment of a laboratory with the uncontrolled environment found in nature. Each experimental watershed replicates the complex natural system of ponds, streams and wetlands while allowing scientists to manage such factors as stream bottom substrate and water flow for their research. ND-LEEF is part of the University’s Environmental Change Initiative (ND-ECI), aimed at applying cutting-edge research to improve environmental management and provide innovative policy solutions to solve current environmental challenges. Originally published by William G. Gilroy at news.nd.edu on September 15, 2015.